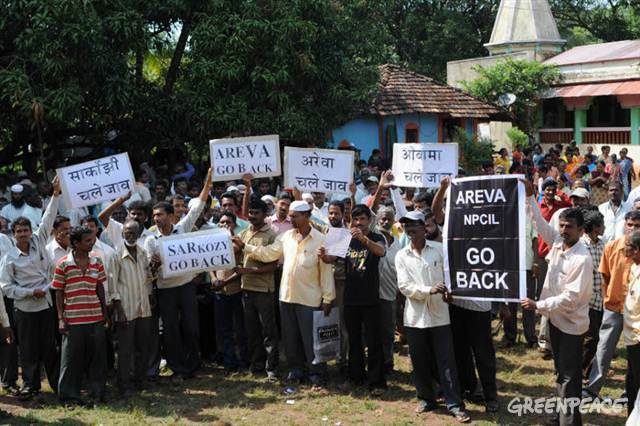 At least 600 people were arrested in India on Monday for opposing the construction of the world’s largest nuclear park in Jaitapur, and hundreds more voluntarily risk jail. As of last week, some 20,000 Sahrawi protesters were gathered in provisional camps outside the cities of El Aaiun, Smara, Dakhla and Bujador, to oppose the Moroccan occupation. The massive protest action started in a smaller scale almost three weeks ago. Hundreds of Indian workers employed to manually clean non-flush toilets have protested in Delhi against their working conditions. The demonstrators began their protests a month ago by criss-crossing the country to highlight their demands. On Sunday, in New Zealand, opponents of mining in the Coromandel launched a new protest after discovering a company drilling for gold and silver in a forestry area. Opposition supporters have held protests in several parts of Tanzania at the slow pace of announcing the result of Sunday’s general election. One day before Halloween, environmentalists wore costumes of dead waterfowl during a protest to show their disdain over the latest tailings pond tragedy in northern Alberta, which has led to the deaths of 350 ducks. A group of around 20 farmers today staged a sit-in at the Ulster Bank in North Dublin in protest at the bank’s treatment of growers following the forced sale of a co-op in Balbriggan. German artist Ralf Schmerberg has constructed an installation that looks like an igloo in Hamburg’s Goose Market, but is made of 322 abandoned fridges as a protest against global warming.